Who hasn’t felt the haunting whispers of desire? Desires are the soul nudges that come late at night, when we are tossing and turning. If we do not stop and reflect what they mean, what happens to them? When we ignore those nudges hoping they will go away a pressure accumulates within us and shows up in the darkness of despair, or depression. I have had people say to me something is missing, and I stay unhappy. Desire then, is your life’s dance floor, so dance and dance like nobody is looking. 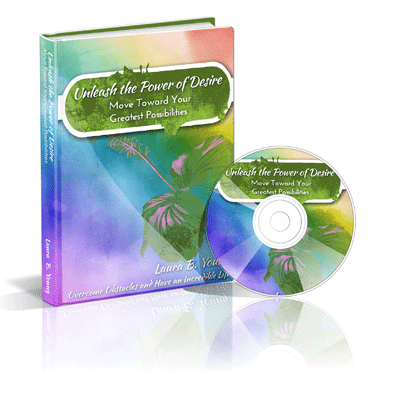 Discover in this work how to use your desires as a springboard to claim all of the abundance that you are here to experience. Overcome Obstacles and Have an Incredible Life, has helped me think about me and feel free to choose what I want for my life in a new light. For the first time, my feelings, wants and desires have been acknowledged as important – that to be true to my own self is actually okay! Laura’s work has helped me embrace my own individuality.